When President Barack Obama travels to Kenya and Ethiopia later this week, he will likely receive a warm public reception. Obama, whose father was Kenyan, is very popular in both countries, as well as in many other nations in sub-Saharan Africa. But it’s not just Obama – as Pew Research Center surveys have shown over the years, the United States consistently receives high marks throughout the region. Below are five charts illustrating how the U.S. is viewed in Africa. 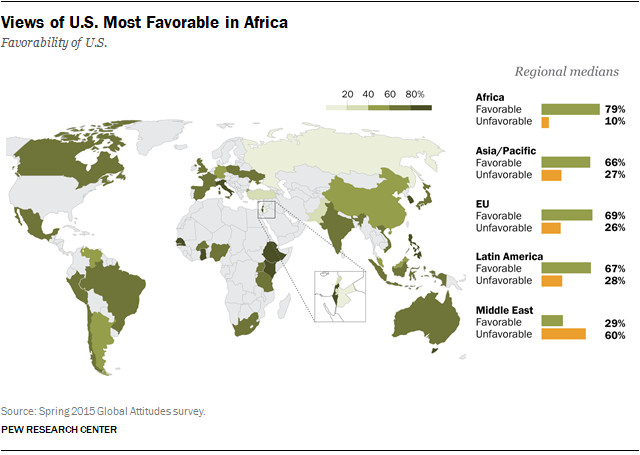 1The U.S. receives higher favorable ratings in Africa than in any other region. Our 2015 survey found mostly positive ratings for the U.S. around the globe, but they were especially high in Africa – across the nine nations surveyed in the region, a median of 79% expressed a favorable opinion of the U.S., while just 10% had an unfavorable view. 2 Obama is very popular in Africa. 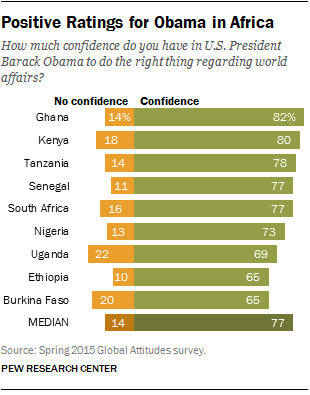 Big majorities in all nine African nations surveyed express confidence in him, including 80% of Kenyans and 65% of Ethiopians. Obama’s predecessor, George W. Bush, also received mostly positive ratings in the region, and the rise in anti-Americanism that occurred in many parts of the world during the Bush era was largely absent in Africa. 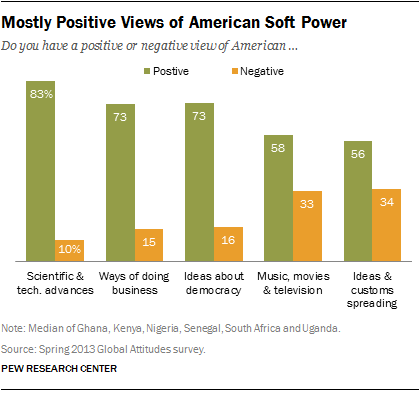 3 Key elements of American soft power are embraced in Africa. As our 2013 survey highlighted, publics in the region tend to express positive attitudes toward American science and technology, ways of doing business, ideas about democracy, and popular culture. Moreover, a median of 56% said it was good that American ideas and customs were spreading to their country – a higher percentage than in the other regions where we asked this question in 2012 and 2013. 4 Through the Millennium Challenge Corporation, the President’s Emergency Plan for AIDS Relief (PEPFAR) and other programs, the U.S. provides assistance to many African nations, and the 2013 Pew Research poll found a widespread belief that U.S. economic aid is having a positive impact. More than half in all six nations surveyed said American aid was having a beneficial effect on their country. 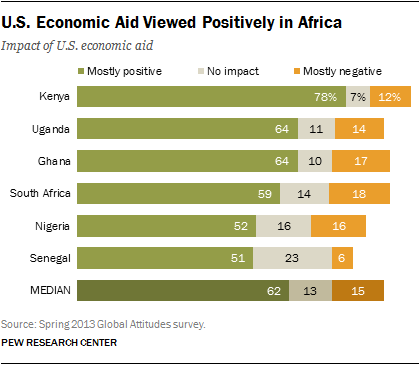 Outside of sub-Saharan Africa, U.S. assistance is not always viewed so positively: The same question was asked in Egypt and Pakistan, where only 24% and 8%, respectively, saw American aid in a favorable light. 5While views of the U.S. are mostly positive in the region, it is not the only major power with a strong image. China also receives favorable reviews in Africa. Across the nine African nations we polled in 2015, a median of 70% express a positive opinion of China, which has invested heavily in the region in recent years. 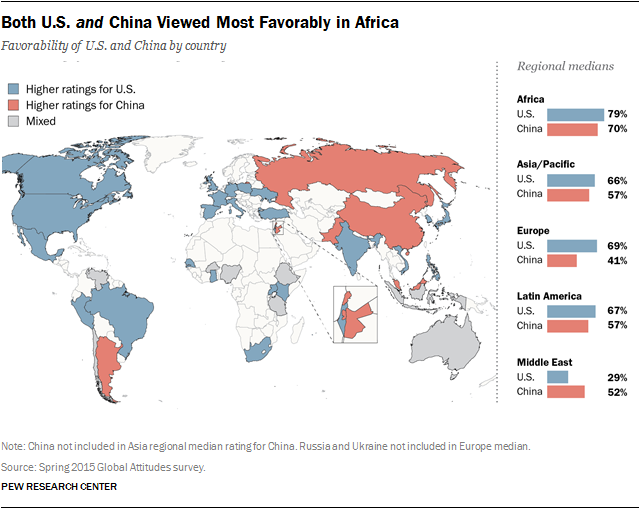 Like the U.S., China receives higher ratings in Africa than in any other part of the world.